May 26, 2011 - In an unprecedented move in the airline industry, leaders of easyJet and the British Airline Pilots' Association (BALPA) will be sharing a platform to voice their joint commitment to a major shift in approach to tackling pilot lifestyle and industrial relations. After months of tension in easyJet, with pilot concerns about pay, working practices and staffing issues, the new easyJet chief executive officer Carolyn McCall has written to all pilots pledging to work with them and BALPA General Secretary Jim McAuslan to repair relationships and aim to make the airline a good and fair employer with an open honest approach to its staff. In her letter Carolyn McCall says "I am going to be blunt. There has been a continued deterioration in relationships between the company and pilots and pilot representatives over the last few years. "For whatever reasons management lost sight of how big a difference having great people makes. It has taken its toll on how pilots feel about working for easyJet, building mistrust and a lack of respect." She said that in the past there had been a failure to meet commitments which the company had made. "I don't want it to be this way and I know pilots and BALPA don't want it either. I want to lead a fundamental change in style and approach." Jim McAuslan commented "This is a brave and game-changing approach. There has been some tough talking but I have nothing but praise for the imaginative move made by Carolyn McCall and easyJet's new leadership. But we all know this will not be delivered without a lot of hard work and proper support." One of the agreements between BALPA and easyJet is that there should be an independent review body with an independent chairperson to look at pilot work patterns. The commitments form part of a package of changes that also includes a 4% increase in basic pay and 5% increase in flight pay effective 1st October 2010, immediate changes to a number of rostering issues in advance of a more substantial review which already has financial support of ?1.2 million earmarked and conversion of a number of temporary staff onto permanent contracts. The package is being put to a membership ballot which closes 9th June 2011. EasyJet Airline Company Limited (styled as easyJet) is a British airline headquartered at London Luton Airport. It carries more passengers than any other United Kingdom-based airline, operating domestic and international scheduled services on 500 routes between 118 European, North African, and West Asian airports. As at 30 September 2009, EasyJet employed 8,000 people, based throughout Europe but mainly in the UK. EasyJet has seen rapid expansion since its establishment in 1995, having grown through a combination of acquisitions and base openings fuelled by consumer demand for low-cost air travel. The airline, along with franchise airline EasyJet Switzerland, now operates over 180 aircraft, mostly Airbus A319. It has 20 bases across Europe, the most important one being London-Gatwick. 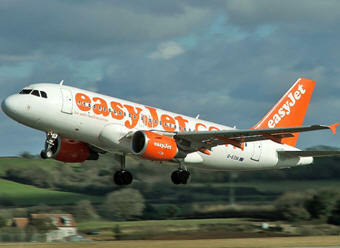 In 2009, EasyJet carried 45.2 million passengers and is the second-largest low-cost carrier in Europe, behind Ryanair. CA Man Sentenced For Trying To Bring Surface To Air Missiles Into The U.S.